This week I spoke with Kyle Dunnigan. He has a quick witted, carefree style that leaves his audiences with a goofy taste in their mouthes. His many credits include an 20 episode run on Comedy Central's hit show Reno 911!, a Comedy Central presents special, and a spot on Late Night with Conan O'Brien. We spoke about his character on Reno 911!, tap dancing, and his mish-mosh style. Andrew: So what are you currently working on right now, Kyle? What is your game plan? Kyle: Right now they are airing the Howie Do It 's on Friday nights on NBC, and I just did 9 episodes of Reno 911, which airs Wednesdays at 10:30 on Comedy Central. I'm working on something with Howie Mandel, we're doing a pilot presentation. Other than that, it's just colleges and road gigs. Andrew: So how often do you go out on the road? Kyle: About 7 days a month. Not that much, I don't like going out on the road that much, I am a nester. Andrew: So that leaves a lot of time for your acting career? Kyle: Yes, well, that and my tap dancing classes. Andrew: [Laughs] And you said you taped 9 episodes of Reno 911? Your character is really being developed into something bigger. Kyle: Yeah, they thought of a really cool idea to bring it back. When my character was in jail, they had him make tapes for his kid, he has a kid with Officer Weigel, one of the women on the show, so when he grew up he would be able to see his dad. Things like how to shave, a birthday wish, it was a funny idea, and we did it in one day and made all these episodes out of it. It was really fun. Andrew: Are you getting recognized more from Reno 911 or Howie Do It? Kyle: More from Reno 911, which is disturbing, because it's a really ugly character. But that's alright. I don't think even 1 person has recognized from Howie Do It, they don't show us that much. It's more about the person that's being pranked, than about our characters, and what we're doing. Andrew: So, going back to stand-up, tell me about your writing style. Are you someone that will pen and paper a joke and then taking it on stage, or are you more inclined to go up on stage with a premise and just work it out? Kyle: I do a combination of both. I'll come up something, or do something with friends that I'll think is funny, I'll work it out on stage, loosely, and and then I'll get home and try to write it up. And then keep going back and forth like that. Andrew: And if somebody asks you what your style is on stage, what do you tell them? Kyle: Umm.. hilarious? [laughs] I think it's physical, and I do a lot of characters. It's mish-mosh. I do music too, and use a loop machine. Andrew: In your opinion, what do you think makes the difference between a good comedian, and a great comedian? Kyle: I think natural talent definitely, but then, there's also the work ethic, some comedians I know work really hard and it really does pay off, but some people are just naturally really funny. I think the really hilarious ones are naturally funny. My favorites, like Brian Regan, make me laugh no matter what they do. Andrew: Now, was there a moment in time when you knew you had that ability to make people laugh? Andrew: If the dollar falls apart, and our economy is in ruin, what do you think the key will be to surviving the impending doom? Kyle: I think you just need to have a rich family. Right? That'll do it! Andrew: Tell me about coming down to Hermosa Beach, what do you think of this area of Los Angeles? Kyle: I like that it doesn't feel like Los Angeles. It feels like a beachy, party community. It feels like a little vacation when you go down there. The air is fresh, you've got the beach. I like it because it feels like an escape. 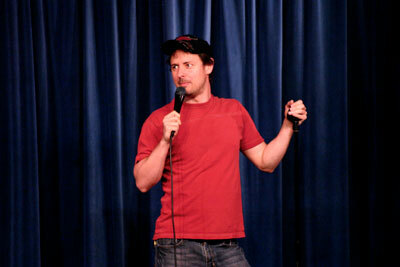 Kyle Dunnigan will be headlining The Comedy & Magic Club on Thursday, April 23rd, and be part of the 20 comedians on Saturday, April 25th 2009. Reservations Required (310) 372-1193 or comedyandmagicclub.com. ER.